Saskatoon's everyday tourists, Leila and Charles Olfert. recently sent me six photos of FFQ (fun, funky, quirky) bike racks in Nashville that inspired this blog. I am hoping other readers will send me more images of FFQ bike racks so I can create a fun gallery. A little research uncovered that Nashville’s bike rack program is not focused on downtown (like most programs), but in the residential neighbourhoods. I was also shocked to learn the budget is $300,000 for 30 racks. That’s, on average $10,000 to design, construct and install the racks – seems a bit pricy to me. 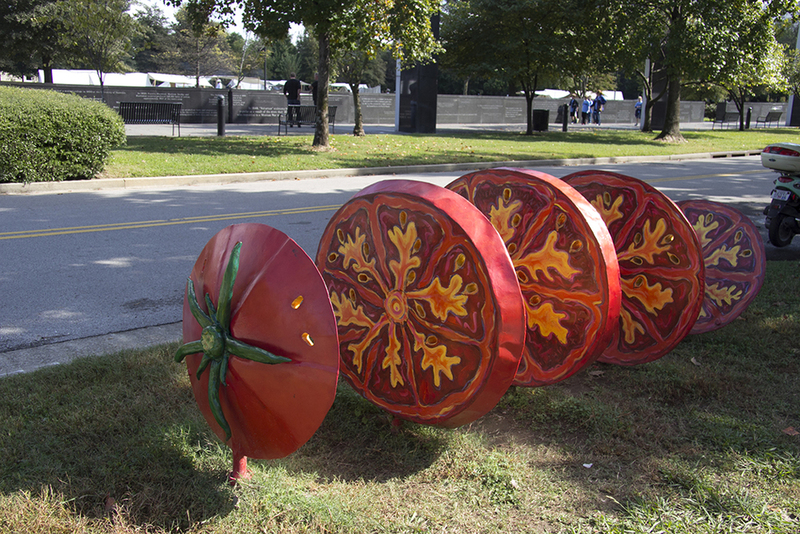 I learned funding for Nashville artists’ bike racks comes from the "Percent for the Arts" program, an policy that says 1 percent of all net proceeds of general obligation bonds issued for construction projects must be spent on public art. That made we wonder if this is art or decoration? The vision for these bike racks is to “be an iconic program for Nashville.” I am not sure I would visit Nashville just to see 30 bike racks, but if I was going, they would be a fun thing to checkout. The racks being dispersed around the city is a great idea on one level, but it limits the ability for a tourist to see them all. However, a map of where all the bike racks are, with the best cycle route to see them and a bike rental program would make for a fun a fun Bike Trail. This raises the question - what does iconic mean? Do we use the word to loosely today? “The bike racks are indeed located all around the city - a map and bike trail would have been really handy. In fact, it would have been handy if the local people knew about the racks and where they were! Probably because of their obscurity and uniqueness, Charles and I made it a mission to find all them! Some of them were in pretty obscure places but it allowed us to explore parts of the city we would not have ordinarily gone to. In some places, we had to go around the block several times before we figured out where the rack was! It was a real treasure hunt. We enjoyed each and every one of the bike racks. Some of them had us wondering just how we would lock our bike up to them though! We have not seen anything like this in our travels and thought it was great! A city is a city and has all the 'city things,' so when we find something peculiar to a city, we latch on to it and run with it. Seeing the bike racks should definitely be on your must-see list. They are pretty cool! As I continued to do my research I found out program favours younger artists, which is an interesting policy. The easiest way to create an iconic art program would be hire a famous artist or architect to design them and get immediate recognition. The idea of giving young artists an opportunity to have their work on permanent public display and to experience the public artwork design process provides an invaluable lesson that will pay dividends in the future. And, you might just find that you have a real gem if one of the artists becomes famous, and you would have one of his/her’s early works. A little more digging and I found that Portland also has an FFQ Bike Program. The Portland Mercury’s Blogtown did a fun piece on The 10 Craziest Bike Racks in Portland. Art / Decoration / Tacky? When I look at the photos of these bike racks I smile and then I wonder. Are these more decoration than art? They are clever and fun, but I don’t see a personal statement in any of these racks. To me, they are a quick, “look-see” experience, not something that makes me ponder. Is this art or decoration or just tacky? Does it matter? Can’t help but wonder if $300,000 could buy one or two nice piece of more thought-provoking public art in higher traffic areas. but that's just me. Found this fun bike rake in Downtown Boise's Linen District this fall. I think it would fit well with Nashville's bike rack program. Found these fun bike racks in front of a grocery store in downtown Salt Lake City. 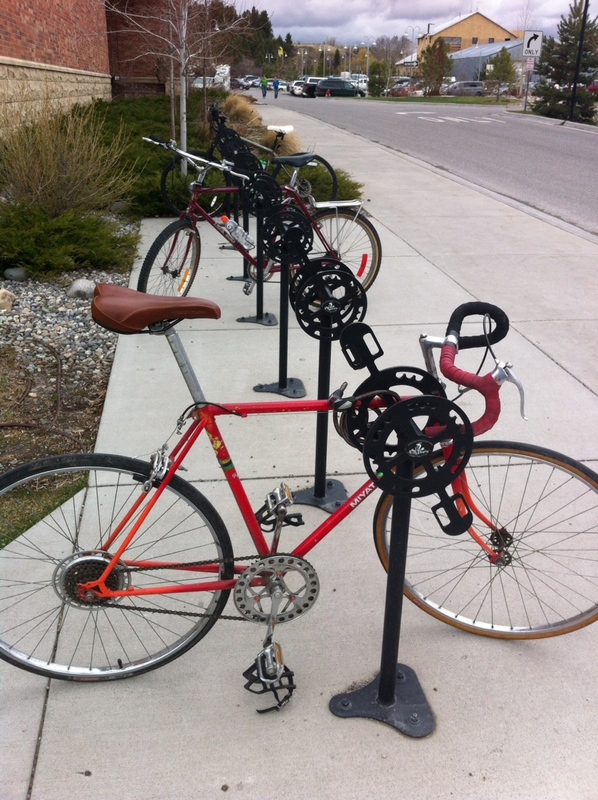 Love this custom bike rack in front of Bozeman's downtown library. Send us photos of your your favourite bike racks and we will add them to this blog. FFQing in Downtown Calgary's Udderly Art Pasture! Next time you are downtown and between meetings and looking for something fun to do head over to the Centennial Parkade along 9th Avenue from 6th to 5th Street and checkout the Udderly Art Legacy Pasture. Or bring the family down on sunny but cold winter day and enjoy the warmth of the greenhouse-like pasture. It is a great place to just let the little ones run. Weekend parking is just $2. Here you will not only find a dozen or so fun, funky, quirky cows basking in the sun, but also the history behind one of Canada's biggest and best public art projects. There are several large didactic panels that tell the story of how the project came to being, a well as background on some of the most famous bovine beauties. Did you know that $1,234,896 was raised for 76 local charities? Or, that each virgin cow was 54" tall head to hoof and 84" long from nose to tail and weighs 90 pounds. How about the fact that 800,000 people visited the website from 36 different countries (that was before iPhones and iPads). You can learn more by visiting the pasture which is open 7-days a week and its Free. Kids will love to have their picture taken with famous beauties like "Jingle Belle" (great christmas card opportunity), Cow Belle with a working Fisher Price musical instrument that kid's can actually play. This is the entrance to the pasture from 5th Street. As you can see it is a wide open space for kids to run in the sun. 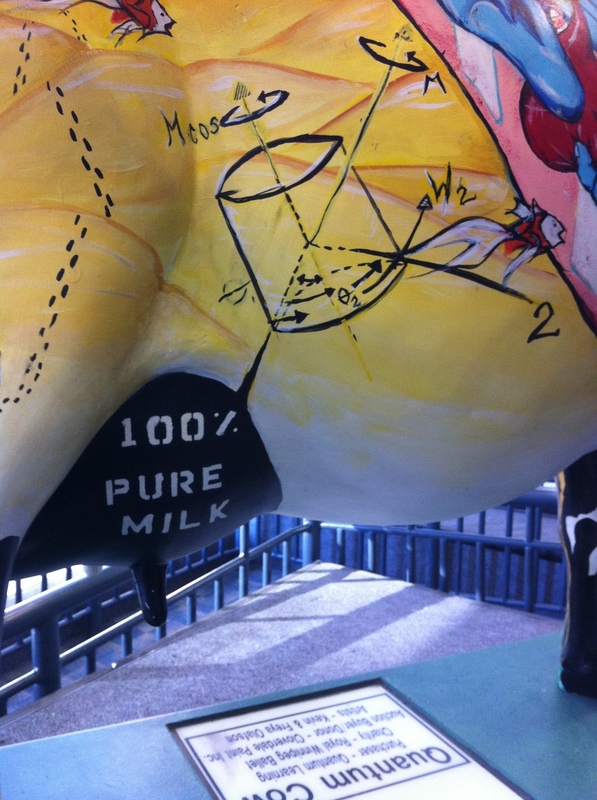 There are several huge information panels that explain the story behind some of the more popular bovine beauties. Moony Trader is one of the first cows you encounter. Damien Manchuk from ACAD was the artist, the piece was commissioned by Hugh McGillvary of CIBC Wood Gundy who had an idea to dress up a cow as a stock-trading pit trader. Hugh took Damien to men's clothing store to see what well-dress cows were wearing in 2000 and let his imagination go to work. The result was a pin-stripped hind quarters, a bright yellow striped power tie and the now antique looking computer strapped to his nose so he could keep up with the TSE quotes 24 hours a day. Chew-Choo was also done by artist Damien Manchuk and was commissioned by Canadian Pacific Railway. Another large information panel gives the history of the project and has a picture of each of the more that 100 cows commissioned for the project. The Udderly Art Pasture is a great place to meet friends or even have lunch together. Too bad there weren't a few tables and chairs. Be careful to look closely as there are lots of subtle details that can be missed at first glance. 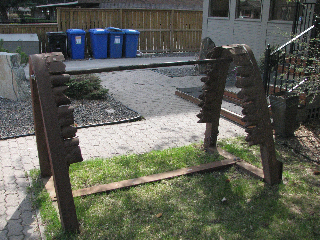 One of my favourite pieces was Chewing the Cud by Evelyn Grant commissioned by the Calgary Downtown Association (yes I am bias as I was the Executive Director of the CDA at the time). The piece was a wonderful bronze bovine schmoozing with the two "fat cats' on Stephen Avenue. Unfortunately the piece was often vandalized not only when it was on the street but even in the pasture. Today all that is left is this photo of Chewing the Cud and The Conversation on Stephen Avenue but it is hard to view with the reflections. This is Clayton Kaplar's photograph of the Chewing the Cud on Stephen Avenue from the book "Udderly Art Colourful Cows for Calgary." 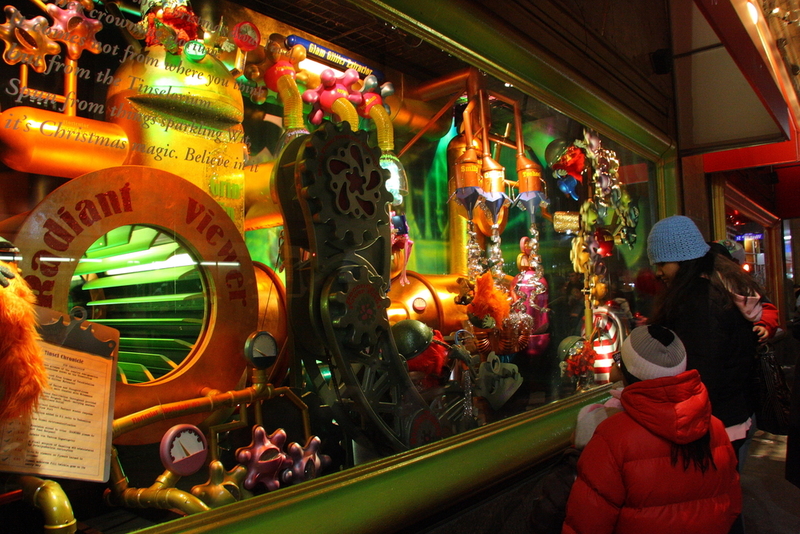 FFQing is the act of finding fun, funky and quirky things as you flaneur the urban spaces and places! There are fun bits of humour everywhere you look. Jingle Belle is a great kodak moment for any family. 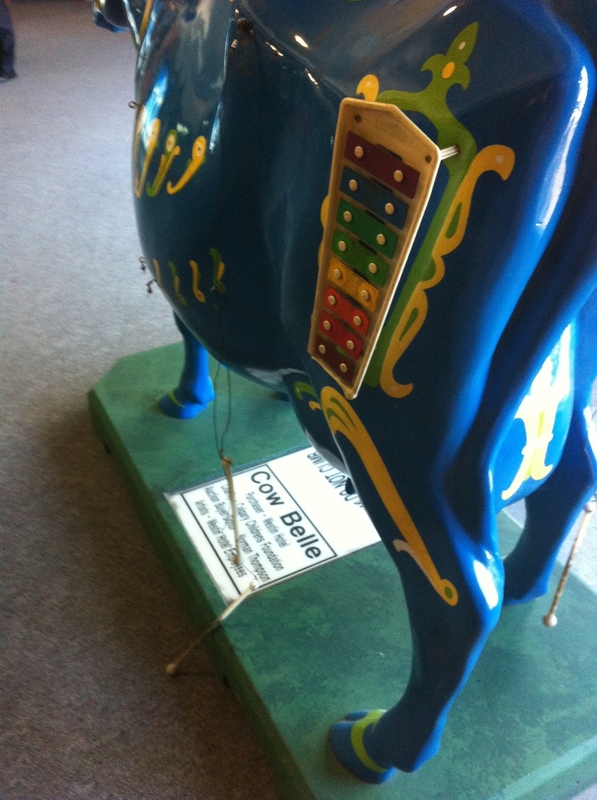 Cow Belle invites visitors to play a song or two. Recently I have been a bit obsessed with the idea of how to add more fun into the “everyday” urban experience. One of the most unexpected and fun experiences we’ve had recently was the discovery of “Freak Alley” in downtown Boise, Idaho. As a former artist who initiated the “Street Art for Gleichen” project in the early ‘80 and later as public gallery curator, art critic and reviewer, Boise’s outdoor art gallery was very intriguing to me. Freak Alley is accessed from Bannock Street and runs between 8th and 9th Streets. There was some serendipity involved as we arrived around the same time as a dance company of young teens and preteens who were using the space for a photo shoot. Good urban spaces are incubators for surprises! While almost every city (large and small) now has a “First Thursday or First Friday” art program and lots have historic mural programs, Boise’s “Freak Alley” is more unique and makes a contemporary statement about Boise’s emergence as an urban playground. While at first glance most would see the space as “graffiti gone wild,” once you take some time to look and ponder the art you realize it is a contemporary exhibition with strong political and personal artistic statements. Freak Alley wall facing the parking lot. The exhibition has the feeling of a salon show with artworks hung side-by-side. This was my favourite, I liked the hybridization of cartoon and surrealism. The alley was full of animation with all of these dancers and their parents prancing about. The costume designs seemed to fit right in with the artwork. This drawing-like painting was also a favourite of mine. As I understand it, Freak Alley began in 2002 when local artist Colby Akers painted a doorway in the alley. It was well received so he asked other building owners if they would allow artists to paint their doors and wall and when they agreed he asked other artists join in the fun! Today, Akers still manages Freak Alley reviewing proposals from both local and out-of-town artists to have their artwork exhibited for one year. Perhaps it is the temporary nature of the artwork that allows it to be seedy and edgy, as opposed to the refined work seen in public galleries and juried public artworks. There was definitely more excitement at “Freak Alley” then when we checked-out BAM aka Boise Art Museum. "River Sculpture" by Alison Sky is a 50-foot high relief made of granite, fused glass, neon, painted aluminum and fog misters on the corner of a building which offers great sight lines. 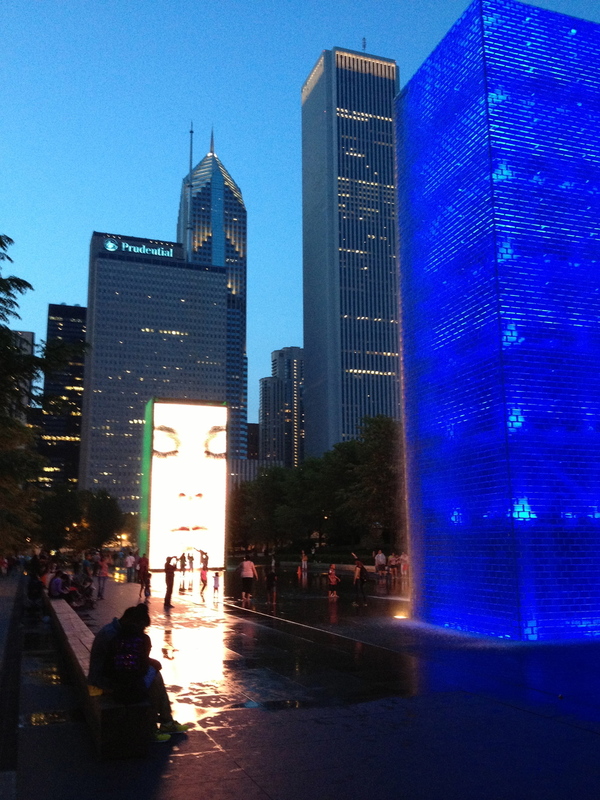 It is a celebration of water and light. Found this little guy playing with a piece of public art depicting children playing marbles. Urban playgrounds should appeal to people of all ages and backgrounds. It isn't just about the restaurants, shops, festivals, museums, attractions and performing arts. Downtown Boise is also home to several more traditional street art/murals. The one we enjoyed the most was “Penny Post Cards” by Mark Baltes, which is a collage of images from actual penny postcards from the late 19th Century. These postcards depicted the beautiful buildings and streets of downtown Boise. It is interesting to see how the downtown's sense of place has evolved over the past 100 years ago. The mural is a dual-faced artwork that changes as you walk around it evolving from abstraction to realism depending on your perspective. The artwork is prominently located on the north wall of Boise’s City Hall on Idaho Street, between Capitol Blvd and 6th Street. You can find more information about Boise’s extensive collection of public art, as well as its architecture and history at Boise Art and History - everything from Egyptian Revival architecture to pagoda turrets. Mark Baltes mural "Penny Post Card" captures the history of downtown Boise with a bit of contemporary interpretation with its collage of images from old postcards. From a the side the image is of an actual post card in its entirety. Many cities have decorated their ugly grey utility boxes with local artwork or images of the city’s history. But the art on Boise’s boxes is not just for beautification purposes, while some look a little amateurish and are not much more than decoration, many had a punch and an edge you don’t often find with this kind of street art. I was personally impressed with a “pop art” piece I found in the Linen District depicting a bear, an elephant, a young girl and a weight lifter. It has an interesting ambiguity that I found puzzling and intriguing at the same time. I like art that makes me think - work for an understanding. Click here to learn more. For a city of 212,000 people (600,000 metro), Boise has an impressive downtown that is quickly evolving into a fun urban playground with a strong culinary and café culture, as well as interesting art scene. If you are in the area it is definitely worth exploring. This mural Les Bois, 1992 was created by Bruce Poe and Dennis Proksa. 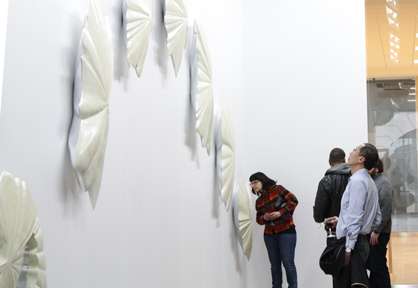 It consists of 24 white steel plates with a random pattern of cut leaf images against a black wall in a parking lot at street level. As you walk past the leaves evolve from whole to fragmented. 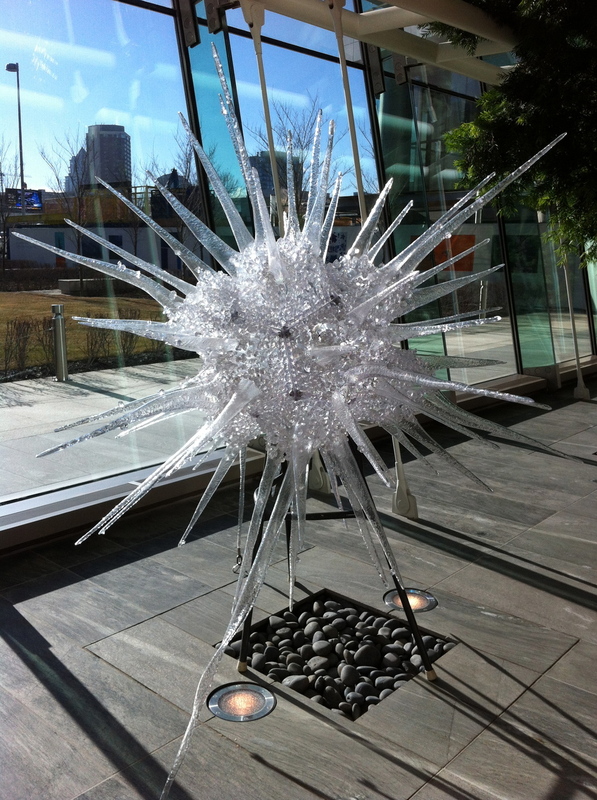 Calgary Civic Art Gallery: Do we dare to be different? While flaneuring last week I wandered past Calgary’s funky old Science Centre next to Mewata Armouries in downtown Calgary’s West End. The concrete Brutalist designed by Calgary architect Jack Long has been funked up over the years with some bold yellow and red elements that together definitely give it a modern art gallery look. One of the proposals for the future of the building is indeed to be a public art gallery - to become Calgary’s Civic Art Gallery. For over 50 years, Calgary’s visual arts community has lamented the fact that we don’t have a civic art gallery. Even smaller Alberta cities like Lethbridge and Grande Prairie have civic art galleries. I understand the future of this building will be announced soon. The old Science Centre looks like a modern work of art with its crayola colours and mix of angular and dome shapes. It is like a mega cubist sculpture. I would be surprised if the City didn’t choose to convert the Science Centre into an art gallery. The City has ambitious plans for the creation of West Village utilizing the land to the west of Mewata Armouries. Using the same thinking as in East Village, the Calgary Civic Art Gallery would function like the National Music Centre and the new Central Library serving as an anchor or catalyst for converting a harsh underutilized urban environment into an attractive place to “live, work and play.” It could work. If we could convert Mewata Armouries into a public farmers’ market then we might have something. Stranger things have happened? The Science Centre is easily accessible by transit, by bike and by car. I am guessing it will take $150 million to convert the building into a public art gallery, approximately the same cost as building the National Music Centre. I can’t help but wonder if this is the best use of $150 million to enhance the visual arts or the arts in general in our city. What else would $150 million buy? One of the biggest issues facing artists living in Calgary today is affordability. Artists don’t make much money and Calgary is not a cheap place to live. Calgary has no old tired warehouse areas with cheap rent that artists can use as “studio/apartment” spaces. Places like Inglewood, Bridgeland, Sunnyside and SunAlta are all becoming more and more upscale as GABEsters (geologist, accountants, bankers, brokers and engineers) move in. I can’t help but wonder if we shouldn’t be investing in more spaces like C-Space King Edward that would be incubators for young artists – visuals, performing and literary – to live and work. Perhaps we could create an artist’s village or better yet what about affordable housing project for seniors and artists – multi-generational. This is a CADA (city's Calgary Arts Development Authority) and Calgary Foundation) project that will see the 100-year-old King Edward School (South Calgary, 1720 – 30th Ave SW) converted into a hub for creativity. Ten anchor tenants will create a 45,000 square foot space with studios, offices, production, exhibition and rehearsal space. The cost of this project is expected to be about $30M (land and renovations). CADA is also partnering with International Ave BRZ to create temporary presentation, studio and workshop space at 1807 42nd St. SE. In Beddington, a group of theatre companies have come together and converted the old community centre into a 200 seat theatre, 4 studio spaces and offices for its two resident theatre groups - Storybook Theatre and Front Row Centre Players. For $150M we could build numerous artists spaces around the city. I expect places like Bowness would love to have a multi-purpose arts centre as part of their revitalization plans and I expect it could be done cheaper than $30M. Land isn’t cheap in South Calgary, nor are renovations of old buildings. Perhaps we could create fun, funky and affordable “container villages” for young Calgary artists to “live, work and play” across the city. We are currently experimenting with one in Sunnyside that might help us understand how this might work! Shaw Millennium Park's use could be enhanced by the addition of an art gallery or creative hub that would bring more events and activities e.g. out door art fair, concerts, dance etc. Why do we need a Civic Art Gallery? One of the most often touted reasons we need a Civic Art Gallery is that we don’t have a facility to host block-buster travelling exhibitions that Vancouver, Edmonton, Toronto and Ottawa get. You know those one’s with the big name artists like – Picasso and Rembrandt! Another reason would be to have a place to showcase Calgary’s civic art collection, which is an important piece of our history and our sense of place. Do new Calgarians need another place where they can discover Calgary indeed does have a history - we have the Glenbow, Fort Calgary and Heritage Park? Do we need a civic gallery to increase the public’s awareness and appreciation of art? 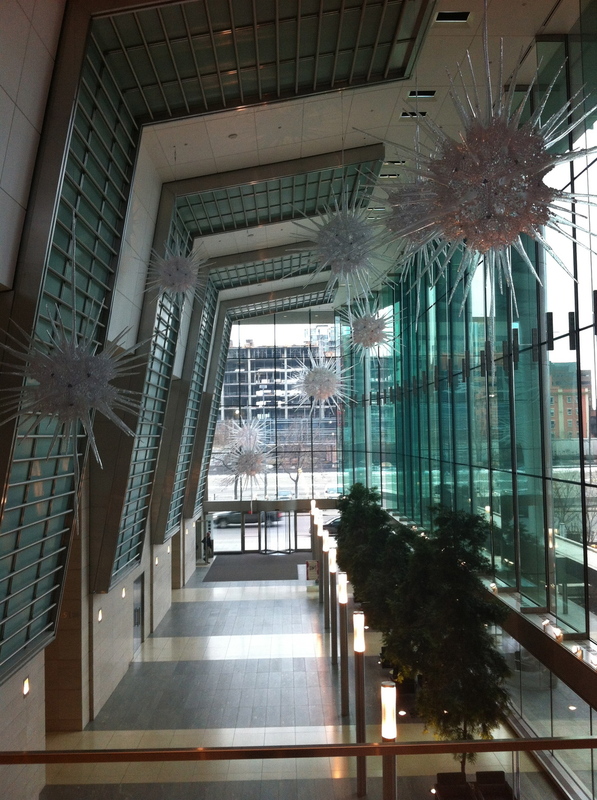 The downtown is full of art, there is public sculpture on almost every block, the office lobbies are full of public art, Hotel Arts, the Hyatt and Bow Valley College are like a public gallery with their extensive collections on public display almost 24/7. It would also give local artists another opportunity to exhibit their work, in addition to Art Gallery of Calgary, MOCA Calgary (old Triangle), Glenbow, as well as galleries at ACAD and University of Calgary and artist-run-centres – New Gallery, Stride and Truck. Edmonton's Art Gallery of Alberta and Churchill Square in February. The cost of a civic gallery isn’t just to build it - there is significant annual operational cost. The Art Gallery of Alberta (Edmonton) has had an operational budget deficit since it moved into their new building. A major civic art gallery needs an operational budget of over $5 million annual if it is going to provide exciting and engaging programming. And that is a conservative number! Interestingly, a $150M foundation with a 4% yield would generate a $6M annual rate of return – enough to support public gallery. I can’t help but wonder what the chronically underfunded Glenbow might do in the way of new programming with a $6M increase in its budget. The Art Gallery of Calgary and MOCA are struggling to find the ongoing operational funding for their spaces. How do we think we are going to fund the operations of another public art gallery? Perhaps the problem is not that we don’t have a civic art gallery, but that we have too many smaller public art galleries. Are we too fragmented? Maybe now is the time for the creation of a Calgary Civic Art Galleries, which would include the Glenbow, MOCA and the Art Gallery of Calgary spaces, staff, membership and volunteers. Perhaps what we need is a good visual arts merger? Perhaps Calgary could dare to be different when it comes to how we support the arts and our artists. We were one of the first cities to build a major skate park, perhaps it is now time create something just as edgy for our artists. Here’s a radical idea! Maybe we should just turn the Science Center over to art groups and let them see what they can do with it - forgo the huge renovation and operational costs of a major civic art gallery? Artists did a great job of turning the old Billingsgate Market building in East Village into a fun, studio, exhibition and event space. Perhaps with a little seed money visual, performance and literary artists could transform the Science Centre into a wonderful creative incubator/hub. Do we dare to be different? SB writes: Give it to artists with rules about protecting the building. Perhaps it could be a below-market version of Art Central. CO writes: Food for thought! 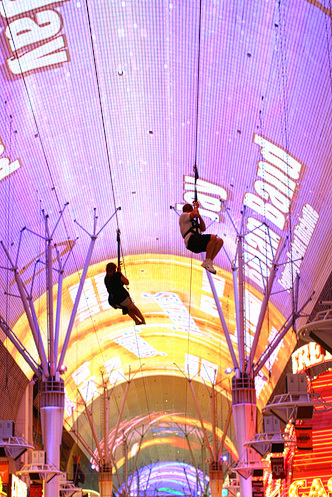 The first question we ask ourselves when doing travel research is "Does it have a fun, funky or quirky potential." Sometimes it is harded to tell and we have to take a chance, other times it is obvious and sometimes you just stumble upon "a find" by taking the sidewalk less travelled. A recent trip to Kennewick, Richland and Pasco Washington, otherwise known as the Tri-Cities had obvious FFQ places like Spudnuts and Cheese Louise (names are almost always a tip off if a place is going to be fun, funky or quirky). Other places like Tulip Lane sounded a bit hokey, but in chatting with locals and other tourist you begin to get an idea aht maybe it is more interesting than you think. We thought it would be fun to share with you a random selection of photos of the FFQing places we found during our fives days of flaneuring in the Tri-Cities. We found these green ladies in historic downtown Kennewick handing out green M&M as part of the First Thursay art walk event. We also found a couple of ducks! We did get to Spudnut Shop to sample their donuts (made from potato flour) and the fun ambience, but the quirkiest thing was the coffee with a straw. Not sure what that is all about? Wandering Richland's Uptown Mall where Spudnuts is located we discovered Desserts by Kelly the "Home of the Atomic Bombe" Cake. We were told they see about 4 a day. We reallly regreet not buying one. The store was definitely quirky - part bakery, part sports memorbilia. Cheese Louise fun starting at the front door with an invitation I couldn't refuse. 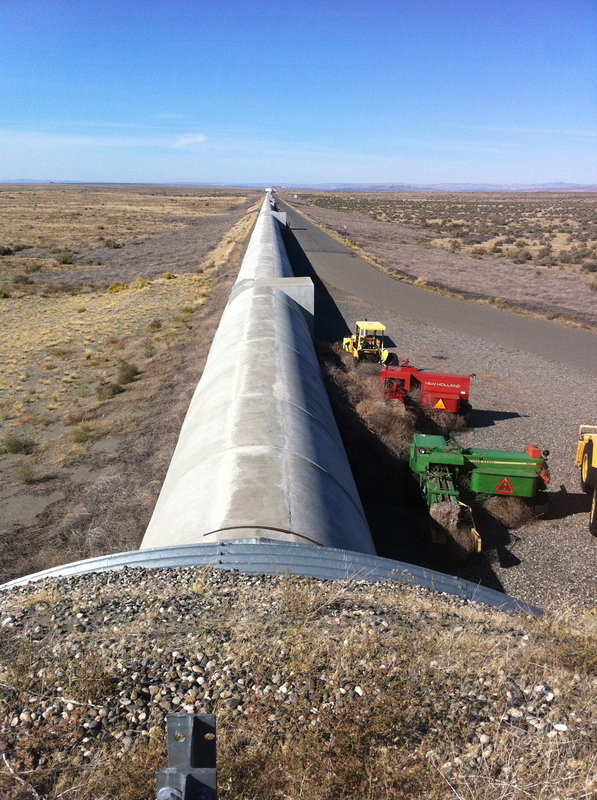 Probably one of the quirkiest places we have ever visited is the LIGO Handford Observatory outside of Richland. I took lots of notes and I thought I kinda understood what they were doing but I am not even sure the boys on Big Bang Theory could totally comprehend the idea of measuring the existence of gravitatinal waves that was first postulated in 1916 as part of Einsteins theory of general relativity. Even in my ignorance it was facinating. If you'd like to try check out their website. Terra Blanca is the gateway to the Red Mountain AVA, offering spectacular views from their patio restaurant. This is what happens with a Napa geologist discovers a special place, with special soils and a special climate in Washington. A fun tour also includes opening the largest wooden doors we have ever seen! Tapteil Vineyard is almost at the end of the Red Mountain road but it is worth it for its sunny patio and sweeping views. They also have two guest houses Spilya and Bella Luna for those who want to soak up the sun, tranquility and wine. Wandering along the river pathway we heard some music and wandered in that direction to find a saturday afternoon "sock hop" at Rosy's Ice Cream & Diner. Fun was being had by all. Country Mercantile began as a humble roadside fruit stand. Today it is a roadside tourist attraction, part farmer's market, part candy store, part chocolatier and part bistro. We were there in the Fall so it was part Fall Fair with rides, hay stack climbing walls, corn maze adn this hay bale maze. Fun, Funky and Quirky all in one. Downtown Pasco is known for having one of the best the framers' market in Washington - sorry we missed it. But we did find a downtown filled with dress shops like this one with quirky windows and fashions. It is a photographer's paradise. The Atomic Ale Brewpub & Eatery was a great find. We were there are on Sunday night and the place had a good buzz with locals hanging out and some playing games. No TVs showing Sunday night football. But they have lots of board games for you to play and lots of great beers with great names based on Richland's atomic culture. I liked it so much I bought the t-shirt! One of the fun finds was Tulip Lane right in the city of Kennewick. It is home to not only serval winneries but DB Glass Studio which is attached to Barnard Griffin Winery. It has to the most artsy winery in the region with live music and its own in house artist. Loved this FFQ glass clouds suspended from the ceiling in the wine tasting event room. Glass classes are offered along with wine tastings - how fun it that! Before we left we had to visit Spudnuts at least once more for a coffee and donut for the road. They had our order waiting for us when we arrived. We'd love to hear about your FFQing places and experiences. Leave a comment! 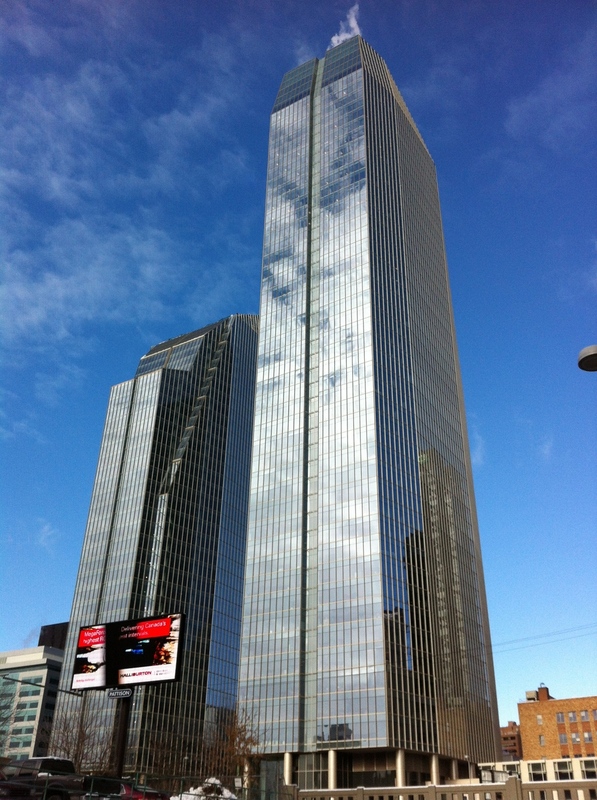 This past week I had some time between meetings downtown so I decided to start flaneuring to see what I might find. It took only minutes to stumble upon Bow Valley College’s (BVC) new South Campus building, which I am embarrassed to say I had not visited. As soon as I opened the door the ambience changed with lots of students milling about - sitting around chatting, studying, reading on their computers, chatting on the phone or wandering the halls. It definitely had the feel of a campus…very different from Calgary’s corporate world. I also noticed the ethnic diversity of the students – it didn’t feel like downtown Calgary! As I had just come from the announcement of the design/build team for the new Central Library, who promised to create a people-gathering place, I couldn’t help but think GEC Architects and the BVC building committee has created a wonderful space where people of all ages and backgrounds fell comfortable hanging out. There is even a Tim Horton’s on the ground level, which had a long line-up – love the street animation! BVC students are surrounded by contemporary art where ever they go. Just one example of how all of the walls have been designed to accommodate art. What probably impressed me the most though was the art – it is everywhere. And, I’m not just talking pretty pictures for decoration; this was serious art – Joanne Cardinal-Shubert, Ron Moppett and Colleen Phillipi and Maureen Enns. Not sure why I was surprised, as the original North Campus building always had lots of interesting contemporary art, but somehow this seemed more impressive. 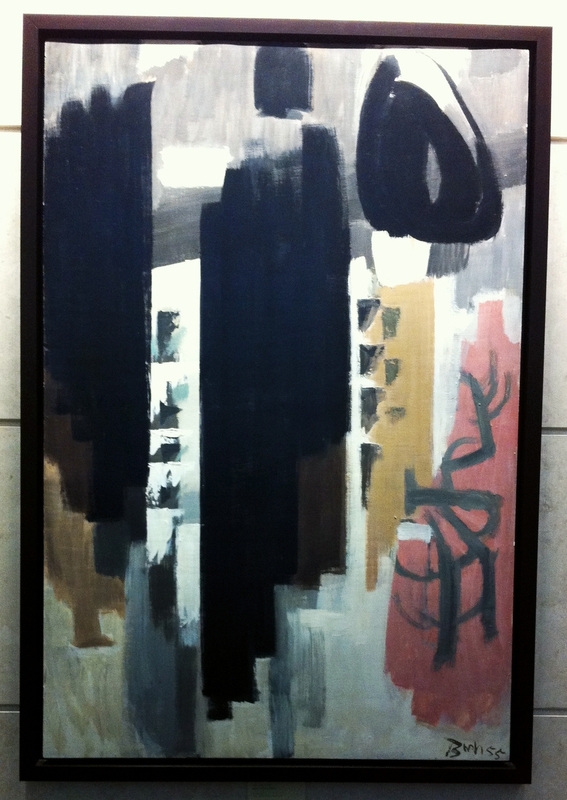 As I continued to flaneur, down the hall, up the stairs, past the food court there was art in every nook and cranny. I loved the fact that there were large didactic labels for each work with information on the artist and the art. It was also obvious that the art had been installed strategically to allow the viewer to make connections between the works. In one area there is a series of works by artists with First Nation heritage that make a very interesting mini-exhibition. Joan Cardinal-Schubert drawing is just one of several pieces by major Calgary and Canadian artists. 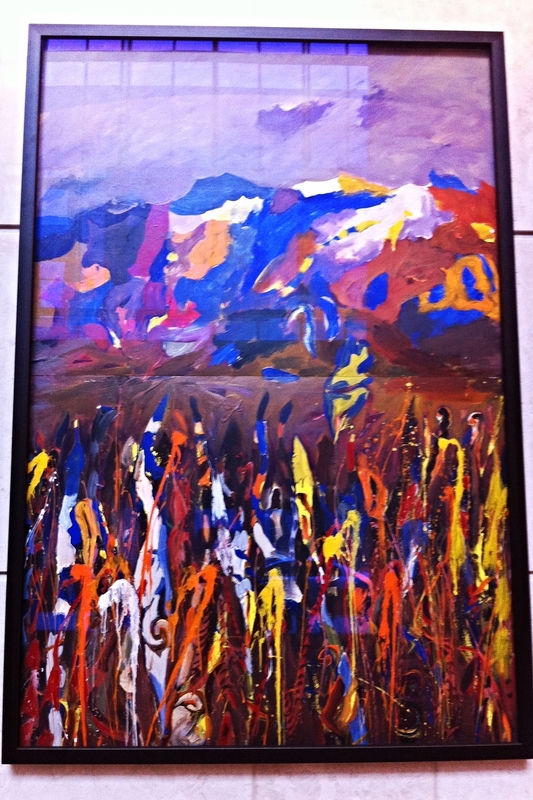 Painting by Richard Emery Duck Chief from the Blackfoot Nation of Siksika is just one of many pieces that celebrate the First Nation culture. The piece is titled "Spirt N Spirit." I was also intrigued by the light box sculpture in the main hall of the South Campus, which reaches up two floors. I later found out it is titled “Chromatic Light Column” and was commissioned by the AFA for the new Calgary Courthouse, but is now in BVC’s permanent collection (there must be a story there). It was completely refurbished with the participation of the artist, Nicholas Roukes and is a great addition to the building’s impressive main hall. Given I have recently been advocating for more fun things in downtown, I would be remiss if I didn’t mention two Franz Spohn Gumball Mosaics, one of Mayor, Nenshi and one of Premier, Alison Redford have a place of prominence on the second floor. And, yes these portraits are made from coloured gum balls – kind of pointillism gone wild! The space definitely had the feel of public gallery, but was much more animated, which is a good thing. Franz Spohn's gum ball portrait of Mayor Nenshi captures the mayor's signature smile with the iconic Calgary Tower in the background. There is a wonderful sense of optimism in this artwork that is at the root of Calgary's sense of place and BVC's place in that culture.